To read further details, such as the deadline (about two weeks from now) and how to submit your entry, read the call for entries. If you don’t have a blog of your own, or if you want to post something anonymously (this can be a touchy subject), Patti has kindly offered to allow people to post your piece on plays with puppies. Email Patti at pattibrehler[at]cavtel[dot]net. Patti wants to be buried with posts! Please help her dream come true! Some twenty years ago, my friend Linda introduced me to the expression, “Feeding two birds with one hand.” I really like this expression. Not only is it kinder than “killing two birds with one stone,” but it’s more evocative. I can actually picture holding my hand out, full of bird seed, and having two birds land on it, whereas not only do I have no desire to imagine killing two birds with a stone, I really don’t know how you’d go about it if you wanted to. So today’s post is about what I’ve been doing when I’m not here posting, and how this is an opportunity to bring diverse aspects of my life together and feed multiple birds — after all, I have two hands, so I should be able to feed at least four birds! 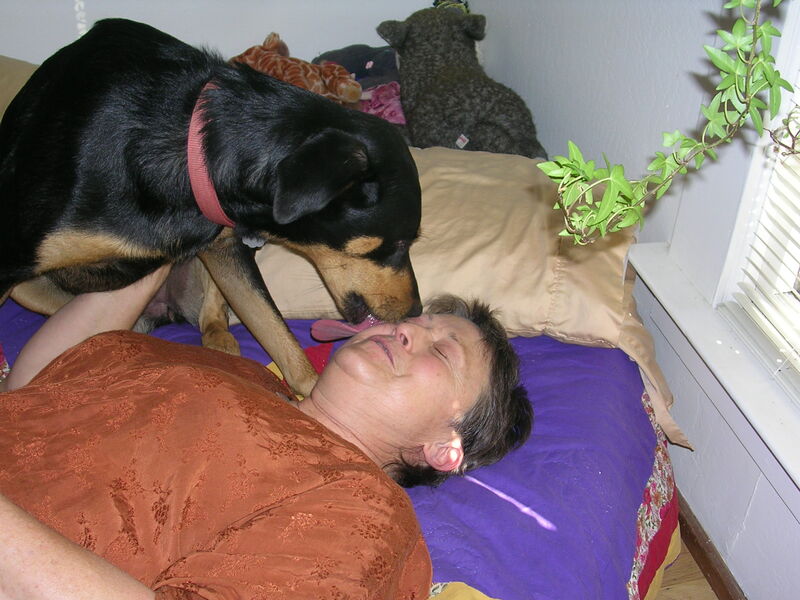 Many of my faithful readers know that over the last three months I have been working on a fundraiser for my Nonviolent Communication (NVC) teacher, Marlena. Marlena’s Teaching Fund takes the form of an online auction, which starts right this very instant coffee! What’s great about this auction? It gives me an opportunity to give back and contribute in a meaningful way to someone who has made a huge difference in my life. I’ve also gotten to “meet” a lot of wonderful people — friends of Marlena’s or friends of my NVC friends — who donated items to the auction. It feels good to be part of something where people are coming together in a spirit of generosity and love. Nothing to be sad about there! 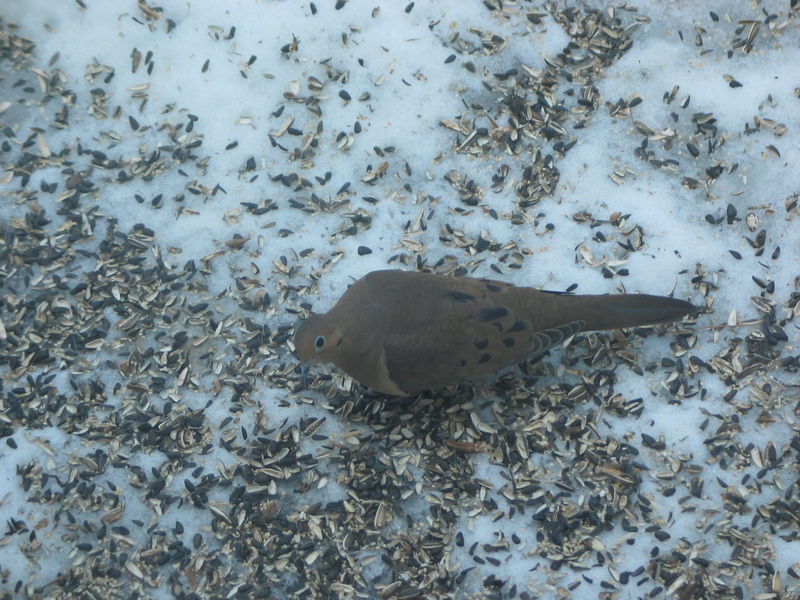 It may be called a "mourning dove," but I was happy to get this picture of it looking at me. Some of my most commented-upon posts here at After Gadget have been those in which I’ve discussed my MCS and/or how fragranced products affect me. Many of you, my beloved readers, have gone in search of nontoxic, fragrance-free products — for your own health, for the access and safety of those with chemical sensitivities around you, and in solidarity with me. This has been so surprising and touching for me! 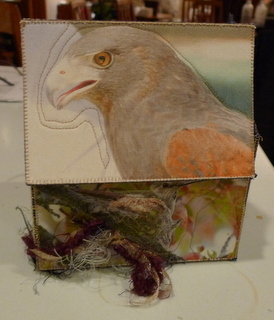 Hunting and pecking for the safe products in the scented aisles of a store? That can get downright hairy! I have too much stuff. My house is full of stuff! Stuff collects dust and mold and dander, all of which I’m allergic to. It gets in the way and leaves less room to maneuver my chair. But some of this stuff is perfectly good stuff. Stuff I can’t use, but that someone else could enjoy — brand-new books I was given but can’t read because I can’t read print books. Snarky posters I got as freebies when the company I ordered from messed up my order. Unused nontoxic/natural lip balm with peppermint oil in it. Inkjet office supplies I bought, forgetting that I now have a laser printer. It will feel great if I can give this stuff a new home. 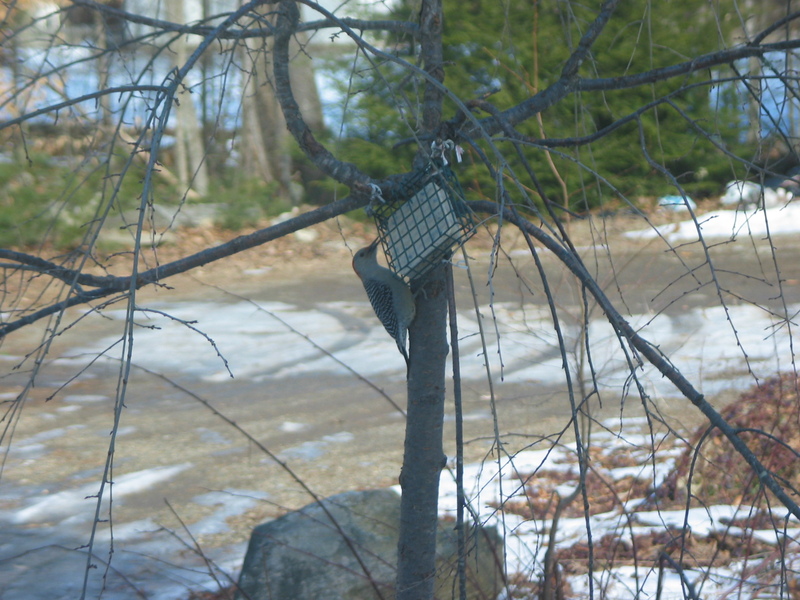 This red-bellied woodpecker is chipping away at the fat, digging out. Inspiring! 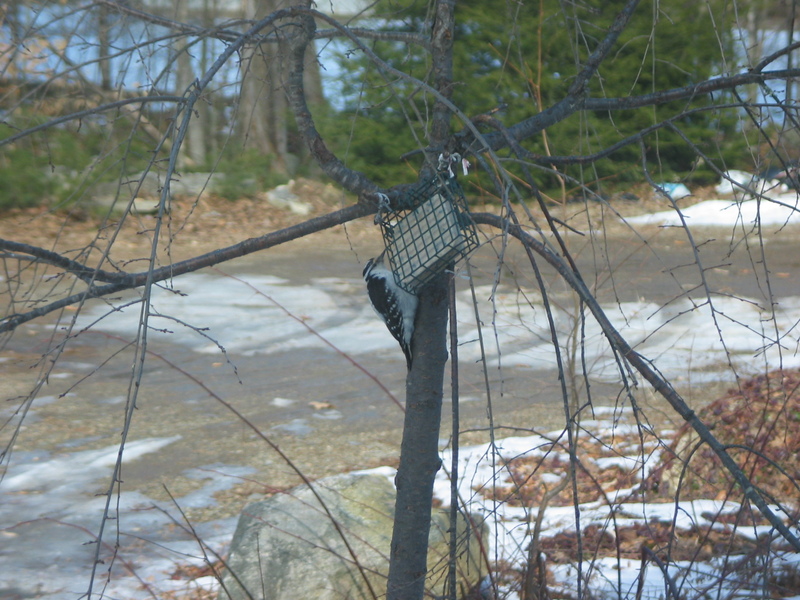 Bird 4 – Bird Feeder as Blog Fodder? I’m never short on ideas for blogs. In fact, my “Posts” folder has almost as many drafts as published posts, and that doesn’t even include all the posts I have in my head that I want to write! 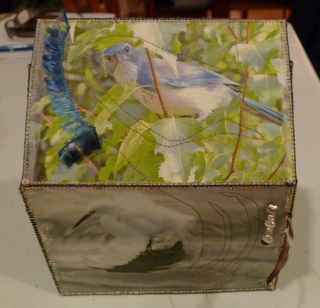 Still, now that I’m doing something with a deadline (the auction is only up for ten days), something I’ve invested so much time and energy in, something that’s so important to me, it pushes me to crank out a post to share with the world. This gives me opportunities, such as to use several of my recent winter bird photos without writing the perfect Birding Thursday post. I can carry myself with pride . . . 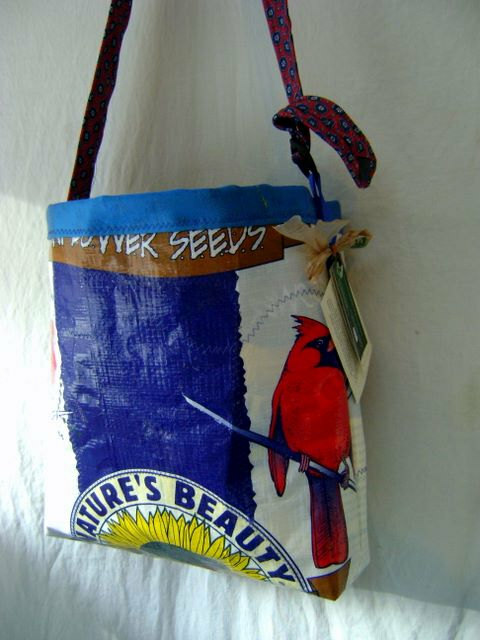 This snazzy tote bag is made from recycled bird seed bags! in taking an old idea like a signal boost and creatively transforming it into something new and different. 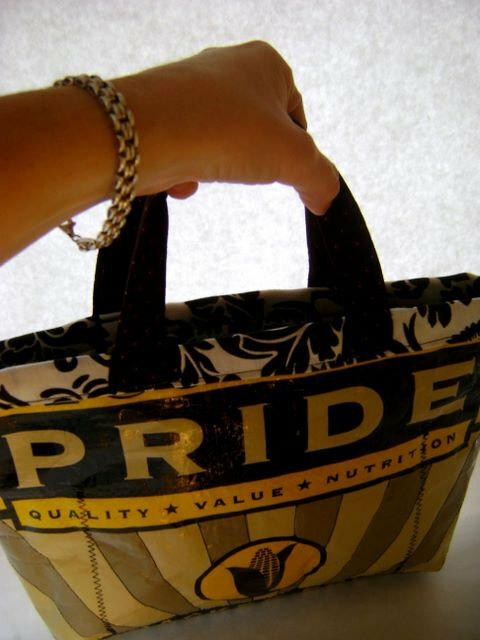 This tote bag is also upcycled from bird seed bags. To think outside the box as a blogger . . . This is quite some outside of a box! can give me several different perspectives on something, depending on how I look at it. It’s true that the tone of this post has been tongue-in-cheek and my objective transparent. Nonetheless, I am still appreciative of the seed Linda planted all those years ago of this kinder, gentler way to speak and act, which is part of the work of NVC, for me. Especially because Linda remains one of my nearest and dearest friends. She’s the one who told me about Marlena’s NVC classes. Taking them together has deepened and strengthened our friendship. Maybe one of you will get to meet her, too? Earlier this month, I announced that the December theme for the disability blog carnival would be “disability and occupy,” and that I wanted submissions by tonight. Well, that’s still the theme, but between being unusually sick and unusually busy, I haven’t even written my own post yet, let alone started gathering the links for the carnival post. Thus, I’m extending the deadline. I know a few of you want to write posts for this and haven’t yet, so I hope this will give you time. The deadline is extended till I publish the actual blog carnival! How’s that for vague? Please spread the word! Share on Facebook, tweet, signal boost, etc. Thank you! I posted about this group once before. Apparently that garnered some interest, and the group proceeded. Now they are opening the group to more people again. Please share with anyone you think might be interested. from anywhere in the country (or the world)! Connect with others dealing with concerns similar to your own. Boston Self Help Center, a small nonprofit run by and for people with disabilities and chronic illnesses, is offering a peer-counseling support group that is being held by telephone. The support group, which is made up of people with a range of disabilities and illnesses, has been meeting for several months and is now looking to add two or three new members. Boston Self Help Center has been providing peer-counseling support groups in a cross-disability setting for over 30 Years. We charge on a sliding fee scale; you pay only what you can afford. Your fees help make possible the continuation of our support-group program. If you are interested in learning more about the group, please leave a message for Linda or Cindy on Boston Self Help Center’s message line: (617) 277-0080 (voice/TTY). My blogging friend and fellow chronically ill gal, The Fibrochondriac, recently wrote to me to tell me that I had helped inspire her to get involved in #OccupyTriCities. I will post about that another time, because what she said really blew me away. I have been so excited by the growing Occupy Wall Street and then worldwide #Occupy movement, but also sad that I could not take part. I have felt like finally, the change I have been hoping for since Ronald Reagan got into office (yes, I’m old), is starting to happen! And I can’t do anything about it! But no, I’ve decided I can do something. There are lots of things people who cannot go #Occupy in an embodied way can do. So I have been trying to gather momentum for #Occupy at Home. Thus, I’ll be blogging, tweeting, and posting to Facebook from a new address and identity. Will you to join me? I love that this is a leaderless movement, and the #Occupy at Home movement should be, too. If you would like to be an admin for the Facebook page or write for the blog or anything else, please, please, join in! The more minds, hearts, and bodies involved, the truer it will be to the movement. Also, it is too much work for one person; that’s why numbers count, even for those at home, alone. Because we are not truly alone. We have each other. Lots of great stuff coming up about disability, chronic illness, the #Occupy movement. For example, I’m putting together a post for the General Strike on Wednesday, November 2. “What?” You say. “How can someone who doesn’t work, who is on SSDI or SSI or worker’s comp take part in the General Strike?” Well, we can! Join me at #Occupy at Home and find out!